Those of you who have ever tried to start or schedule a Google Hangout know how cumbersome it can be at times to simply start a new Hangout, right? Step 0. In order to use Google Hangouts in the first place, you need to enable your Google+ profile on CGXchange. If you haven't done this yet, please check this tutorial for instructions to learn how to setup your G+ profile: Web conferencing with Google Hangouts; then move on to Step 1. Step 1. To start a Hangout from your Outlook, you first need to download and install the Hangouts for Microsoft Outlook Plugin: Hangouts for Microsoft Outlook Plug-in. you can invite other non-CGIAR users by clicking on 'Allow'. Please ensure the external users have a Google account and Google+ profile created with their account. By adding the external users, they will automatically receive your call notification to join the meeting. Note: You will need to ensure you are logged in with your CGXchange account to be able to start the session the day of the meeting. 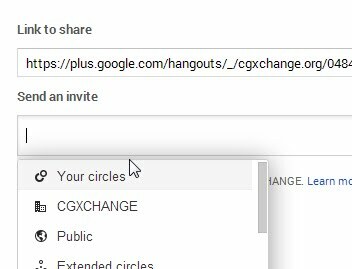 Finally, for your information: we have enabled Google+ premium features and Google Hangouts on Air on CGXchange which would allow you to broadcast your hangout as an option for delivering large presentations, trainings or demonstrations. Enjoy!